Verani Realty is among the largest and most elite in the country, according to The 2018 REAL Trends Five Hundred, which ranks the largest 500 real estate brokerages both by sales volume and closed transaction sides for 2017. HomeServices of America, jumped up the ranks to the second-largest brokerage in the country, fueled by a 34% increase in sides from 2016. A testament to Verani’s hard work, CEO Margherita Verani was also profiled in the 168-page report released in March. Verani Realty itself landed at No. 173 in sides and No. 209 in volume, out of 1,752 firms across the country. Verani Realty also earned a spot in REAL Trends’ Billionaire’s Club, which lists firms that closed at least one billion dollars in residential real estate. 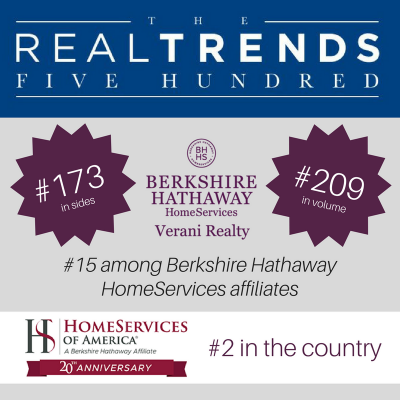 Verani Realty reached over $1.2 billion in sales volume in 2017, 15th among all Berkshire Hathaway HomeServices affiliates. A consistent trend among the 500 firms recognized is that size and leadership play a significant role in positive growth for elite residential real estate firms throughout the country. To learn more about The REAL Trends Five Hundred or view the full report and read Verani Realty’s spotlight on page 14, visit realtrends.com. HomeServices of America has multiple real estate-related companies, including Berkshire Hathaway HomeServices. REAL Trends is a privately-held publishing, consulting and communications company that provides news, analysis, and information about the residential brokerage industry.